Make a donation and spread the word, your support is crucial! To help animals and the people who love them. We fund nonprofit causes that need assistance in their work, caring for and protecting animals. Iowa Parrot Rescue is a well-regarded parrot rescue and education source for parrot rescue around the country. The Doris Day Equine Center holds trainings for the trainers to select horse rescues across the country. As with DDAF’s previous grants to this group, our support will contribute to gasoline cards for drivers for the pet food meals delivered to Meals on Wheels clientele. A very small Southern Minnesota horse sanctuary for 10 horses, this group operates on a limited budget, and our grant will assist with hay purchases for the winter. 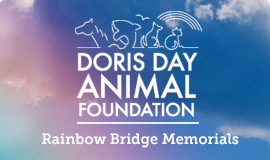 In addition to rescuing, fostering, and rehoming companion animals, DDAF will help fund their pet food pantry and Safe at Home program for low-income and senior families with needs for pet food, veterinary care, and transportation to and from pet clinics. DDAF’s grant will help lower spay & neuter costs for residents of 14 Middle Tennessee citizens meeting low-income provisions. 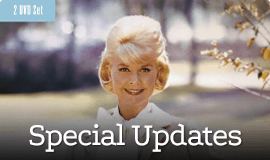 Check out the Doris Day Film Festival at the historic, renovated Stanford Theatre in Palo Alto, April 19 – May 23!